As long as jobs pay poverty wages, the people who work those jobs will be poor. 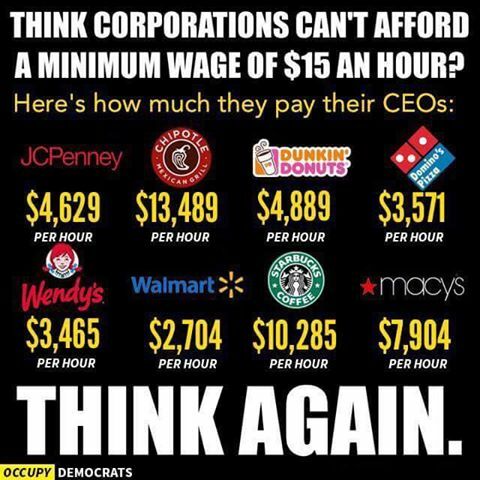 burn this graphic into your brain and ask, Why aren’t they all equally aghast that anyone should be paid these PER HOUR “wages”? Wages are not what we “earn,” wages are what we are “paid.” Poorly paid people often do the dirty, often dangerous work most necessary to our existence and get paid the least, while the work gets cleaner and healthier as you go up the ladder. Really wealthy people at the top often get paid for doing little or nothing by living off the profits they make off the people who actually do the work. Poorly paid people become the most exploited in other ways. Since Social Security payments are based on income on a sliding scale, they are very low for those paid low wages. The average monthly social security payment is around $1,345 while those few who have worked 35 years at the highest end of the Social Security table receive about twice as much. Those paid low wages (if they can even find work) receive little or nothing in their old age and don’t live as long, so they often collect even less. People at the top of the wealth ladder live more than a decade longer than those at the bottom, and thus end up collecting more of what they paid into the system. Money doesn’t make money. Money exploits labor and in the exploitation of labor it accumulates more profit and that’s the only way money makes money—through the exploitation of labor of somebody else. … The viciousness of the capitalist system is to be found in the fact that those who labor do not enjoy the fruits of their labor. My father was a trade unionist. I have no recollection of him drilling trade unionism into us as kids. But I have the clearest memory of him planting flowers in our garden and then planting a small coin. We watched the flowers grow and he dug up the coin. He showed us that if you plant flowers, they grow. But if you plant money in the soil, it doesn’t. Money only grows when you plant it on the backs of working people. My father died when I was nine but I never forgot that. So great to know there are people who understand the exploitation of labor. I was raised in a radical household and have no money in stocks, and have a very hard time getting other people to understand why (one does not ethically make money from other people’s labor). The only reason I have any money is that I labored for years, saved a bit, my husband now works as an RN and makes decent money, and I can save something from my disability check. 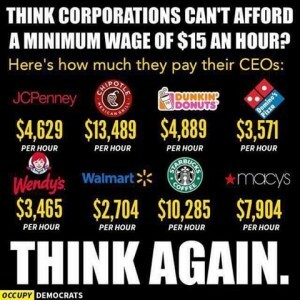 We both agree that even $15 an hour is pretty pathetic UNLESS you live in a society with adequate public housing, free education, free health care, etc.